When it comes to ductwork installation, one can opt for designs such as radiant piping, extended plenum or even a combination of both. In addition, ductwork can run through crawlspaces, attics, basements, or the ceiling. Whatever design you choose, it is advisable to make sure that you comply with ductwork installation and energy efficiency codes set by local authorities where you live. For instance, duct installations for gas fired air furnaces must meet certain safety requirements. This includes flame spreading and smoke development capabilities. This is one of the reasons some commercial and residential buildings have ductwork for gas air furnaces on the outside. Even installations for HVAC and central heating systems that use electricity must satisfy the set safety requirements. In general, such ductwork installations should not have air leaks caused by sharp bends or improper sizing. If your home has vaulted ceilings, it is advisable to go for plenum style ducts. Extended plenum designs also come in handy if you have downflow furnaces in crawlspaces, upflow furnaces in basements, or horizontal furnaces in attics. In this case, the ductwork installation extends at right angles from the furnace with branches that supply registers in different rooms with air. Unlike the extended plenum design, the radial piping design has round pipes attached to the furnace. The beauty of using radial piping designs for ductwork is they are easy to install and do not lose air. You could also use semi-rigid flex piping as air ducts inside your home and run the pipes from each room in your home to the furnaces. Alternatively, you can opt to run ductwork under the ceiling plane. This approach has several advantages. 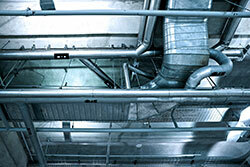 Firstly, the ductwork does not develop conducive gains or losses. Secondly, such a design promotes good airflow. Thirdly, running ductwork under the ceiling works well especially in hot and humid areas.